M&M Court Reporting Service opened in 1970 with two reporters, Margaret "Peggy" Satterfield and Mack Lane. Since then the business has grown, the number of reporters has increased, the services offered have multiplied, and the top-notch quality of service has remained the same. M&M began expanding its area of coverage as its reputation for quality work spread throughout the legal community. We have now grown to include two full-service offices: one located at 101 S Capitol Blvd, Ste 503 , Boise, covering Southern Idaho and Eastern Oregon; and the other located at 816 E. Sherman Avenue, Suite 7, Coeur d'Alene, covering Northern Idaho as well as Eastern Washington. M&M proudly covers more territory than any other agency in the State of Idaho. 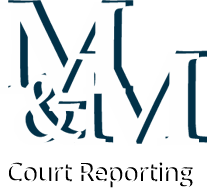 M&M Court Reporting Service has grown to be a leader in technology, offering a vast variety of services to assist with case management and litigation presentation, including video services (as well as video conferencing), and online archival of transcripts and exhibits. As we get closer to our 50th year in business, M&M Court Reporting Service is looking forward to continuing its tradition of excellence as well as implementing new and better ways of providing quality customer service.